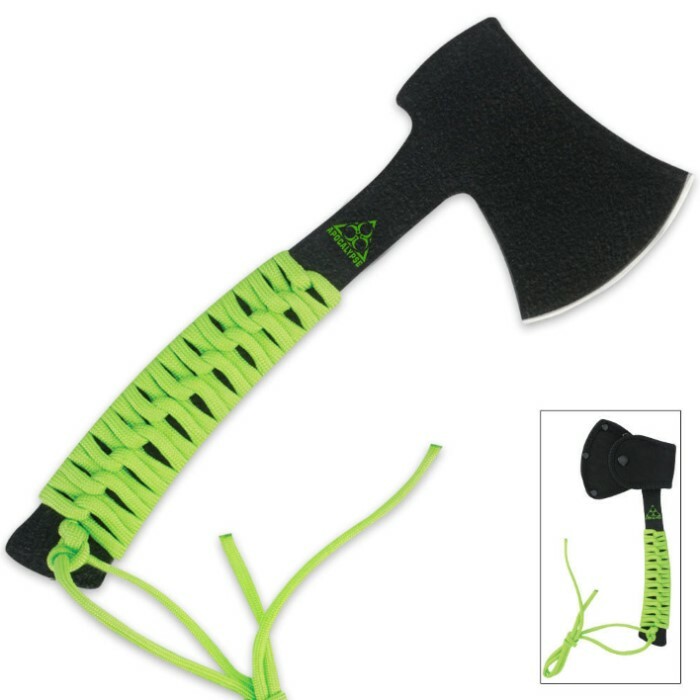 Apocalypse Combat Hatchet with Sheath | BUDK.com - Knives & Swords At The Lowest Prices! 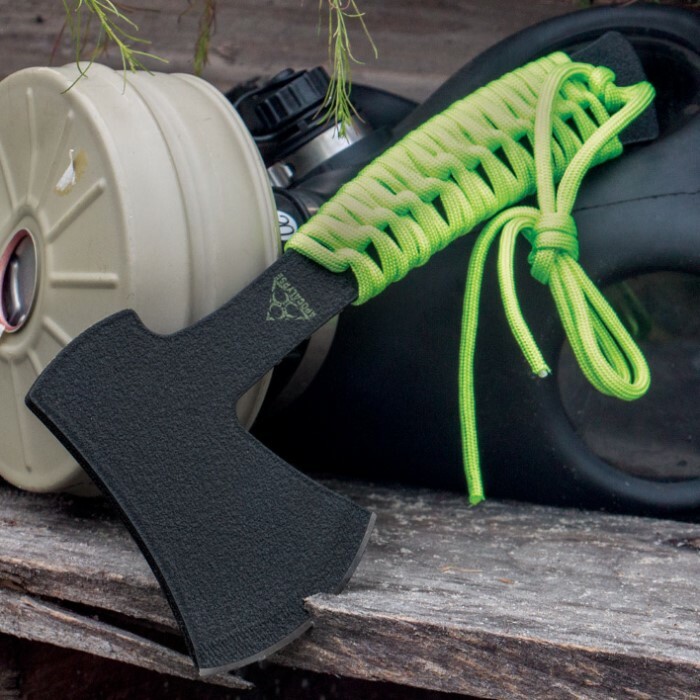 You'll be ready for the apocalypse with this new hatchet! Crafted of one solid piece of cold, hard, stainless steel, this hatchet is razor sharp. The handle is wrapped in bright green, 300 lb. paracord, which may be unwrapped and utilized as rope in extreme situations. Got this to split fat wood into kindling, but it does so much more. Keeps a good edge with occasional run over a whetstone. It hangs easily from your belt and is light enough to not notice it is there. I keep mine handy when I'm out in the woods, camping or about to start a project. It is invaluable. And knowing you have emergency paracord if needed just sweetens the deal. Great buy. Very simple and to the point. The edge is surprisingly sharp out of the box and exceeds my expectations for something this cheap. Worth $10 all day, and the paint goes nicely with the theme. seems like it is good built but as for sharp not at all. you could maybe hammer the zombie to death with it but that's about it. Was smaller than expected, but tht worked out fine. Is now in my EDC. Got it on BOGO and gave the toher to a friend. His wife siad he used it for everything, including tearing/pulling up old carpet LOL.I love mine; haven't torture tested it, but don't feel the need, it's granite solid and laser sharp. Blade was sharp right out of the box. The tool itself is small, even for a hatchet. Cut through some grapevines easily and made kindling without problems. You may want to pick up a big machete to compensate, if you know what I mean. Great priced tool. Green paracord sweetened the deal. It is rather small and shipping took awhile though but overall satisfied with hatchet. Good axe, satisfied with it it's just small. But for the price it is worth it. I didn't want to because i was afraid of it breaking, but my little brother has been throwing it at his board and it sticks right into the wood and is great for throwing. At a low price if it breaks i'll simply buy another, great deal for this little wonder.